Permanent marker writes on just about any household surface, including areas you'd rather it did not, such as on a laminate floor. Harsh chemicals and abrasive cleaners may harm laminate materials, so removing that Sharpie mark requires a gentle solution. Citrus-based sticker removers, foam-cleaning erasers and rubbing alcohol are several treatments that remove marker ink from laminates. Test any treatment in an inconspicuous area first to ensure it does not discolor or otherwise damage the laminate surface. Apply a citrus-based sticker and adhesive remover to the tip of a cotton swab; then wipe the swab directly over the inked areas. After several minutes, wipe up the liquid with an absorbent white cloth. Remove the citrus residue with a slightly damp cloth afterwards. Do not saturate the area with water, as it may damage the laminate. 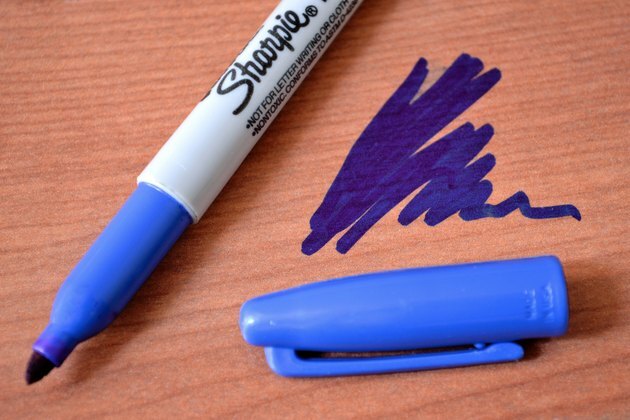 Write with a dry erase marker directly atop the Sharpie marks to loosen the permanent ink from the laminate. Wipe the area up immediately with paper towels or with an eraser designed for dry-erase boards. 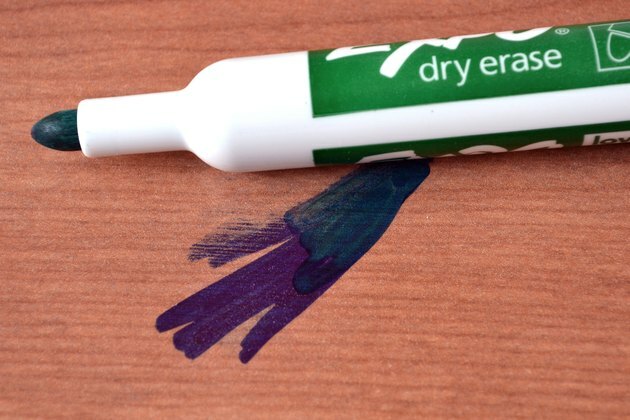 Dry-erase wipes or rubbing alcohol may be used to remove any remaining ink. 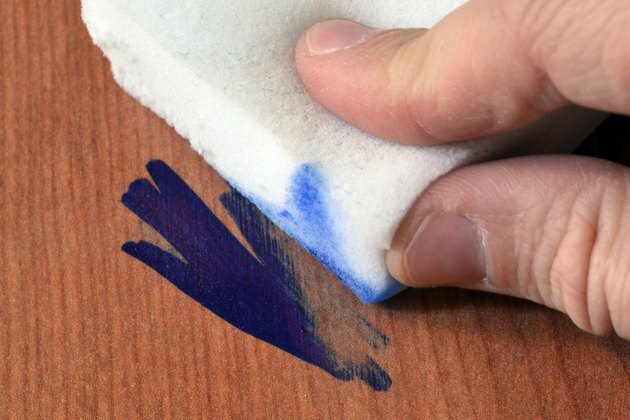 A melamine foam eraser -- the spongy material designed to remove scuffs, marks and grease from many household surfaces -- may remove the ink from the laminate as well, especially if the ink is fairly fresh. Wet a corner of the foam eraser; then rub it gently over the ink, working from one end of the ink mark to the other. Rub gently at first, applying more pressure only if needed. Rubbing too vigorously may damage the look of the laminate. 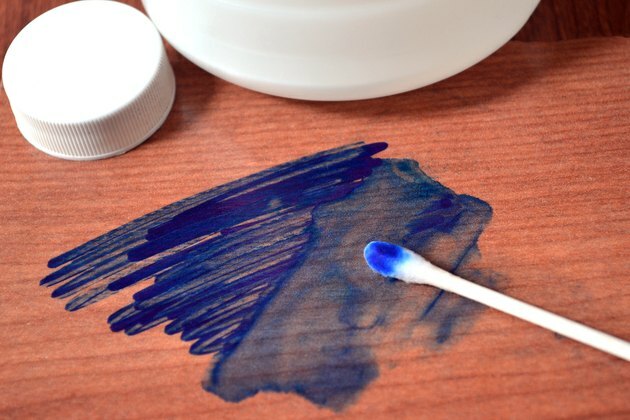 Rubbing alcohol removes permanent inks from a multitude of surfaces. 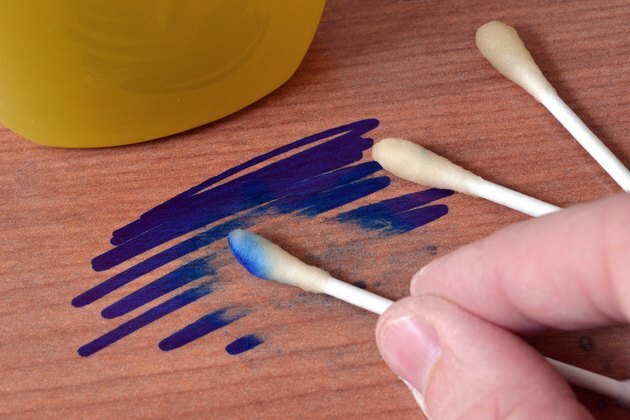 Apply a small amount to a cotton swab or cotton ball; then rub the wet cotton over ink from one end of the mark to the other, rather than wiping across the mark. Rotate to a fresh area of the cotton as it absorbs the ink to prevent spreading it around. Wipe the area with a damp white cloth afterwards; then pat dry with a fresh white cloth. If the alcohol does not remove the ink entirely, use acetone or nail polish remover as a last resort, applying it with a cotton swab or cotton ball. Open windows or turn on a ceiling fan to avoid breathing in the fumes. Wipe the area with a fresh white damp cloth afterwards.